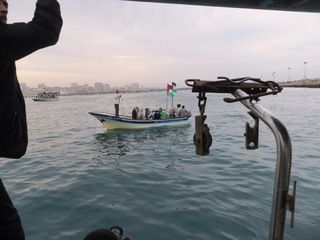 Palestine's fishing industry and fisher-people's livelihoods devastated by Israel's closure of Palestine's maritime waters for military purposes and to protect gas exploration, platforms and pipelines. Fishing is one of main pillars of Palestinian economy in the Gaza Strip. Since 1967, Israel has inflicted onerous ad hoc restrictions on Palestinian fishermen operating off the Gaza Coast and rendered 85% of the maritime space in Gaza inaccessible. Under the Oslo Agreements, the fishing range was 20 nautical miles (approximately 37 km). However, over the years, the Israeli military has gradually reduced this range, severely damaging the livelihood of thousands of families and the availability of this basic and inexpensive food in the markets, which had served as a significant nutritional source. 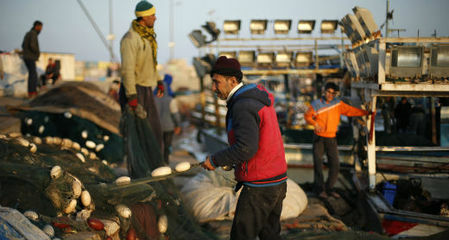 Data from the UN agency, OCHA indicate that, between 2000 and 2010, the number of fishermen in Gaza dropped from about 10,000 to fewer than 4,000 . Israel’s consecutive military attacks on the Gaza Strip and the deliberate targeting of vital infrastructure and damage to sewage facilities have had serious environmental consequences destroying vital fish habitats. All aspects of Palestinian fishing industry have been impacted from attacks on fishermen, willful killing, unlawful detentions, and the forced removal of fishermen from occupied territory. The closure of Gaza's sea and land buffer has crippled the economy and reduced the supply of fish, a protein rich source of food. This in a situation where 57 percent of the population in the Gaza Strip, are currently food insecure. 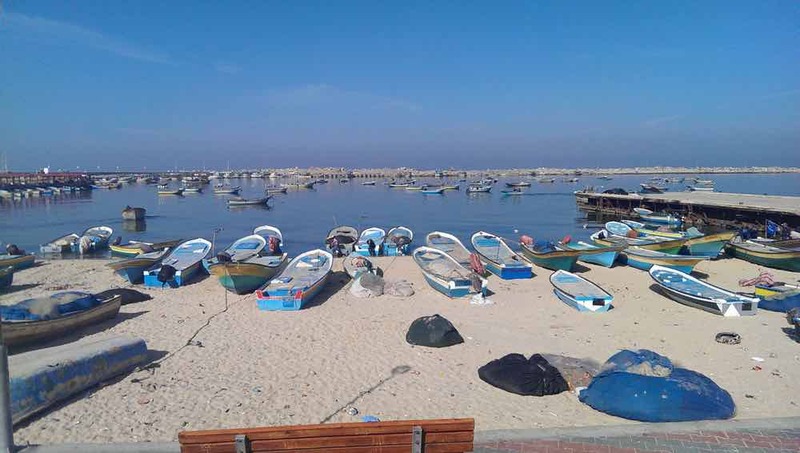 In 2000, the reduction of the fishing zone to 6 nautical miles (nm) resulted in widespread food shortages, with wholesalers reporting 100 percent fish shortages in the West Bank and 33 percent fish shortages in Gaza. Further the restrictions on fishing since 2001 have “led to intensive, close-shore fishing which has depleted stocks from the natural breeding grounds and threatened the fisheries resource base” . This range is sometimes further reduced to 3 (nm) . To enforce the closure, Israel routinely attacks Palestinian fishermen using live ammunition, and arrests, detains and removes protected Palestinian civilian fishermen beyond the borders of the occupied territory. Israel’s navy also routinely seizes Palestinian fishing boats charging a substantial 500 NIS fee for their return, amounting to unlawful requisition [1,2]. The discovery of natural gas resources in the Mediterranean Sea prompted Israel to maintain a ruthless 6 nautical mile military closure of the Gaza Maritime Zone. The primary companies involved in the Yam Tethy's joint venture for the Mari-B lease include United States corporation Noble Energy (operator) (47 percent) and Israeli corporations Delek Drilling (25.5 percent) Svner (23 percent) Delek Investment (4.4 percent). While the main companies operating the Tamae lease and using Mari-B and the El-Arish pipeline is United States corporation Noble Energy (operator) (36 percent) and Israeli corporations Isramco Negav 2 (28.75 percent) Delek Drilling (16.62 percent) Avner (15.62 percent) Dor Gas (4 percent). Project Details All aspects of Palestinian fishing industry have been impacted from attacks on fishermen, willful killing, unlawful detentions, and the forced removal of fishermen from occupied territory. The closure of Gaza's sea and land buffer has crippled the economy and reduced the supply of fish, a protein rich source of food, to the point that 57 percent of the population in the Gaza Strip, are currently food insecure. Israel has forced a closure of the Gaza Strip to protect the gas interests of local and international companies. The primary companies involved in the Yam Tethy's joint venture for the Mari-B lease include United States corporation Noble Energy (operator) (47 percent) and Israeli corporations Delek Drilling (25.5 percent) Svner (23 percent) Delek Investment (4.4 percent). While the main companies operating the Tamar lease and using Mari-B and the El-Arish pipeline are United States corporation Noble Energy (operator) (36 percent) and Israeli corporations Isramco Negav 2 (28.75 percent) Delek Drilling (16.62 percent) Avner (15.62 percent) Dor Gas (4 percent). Company Names or State Enterprises NOBLE ENERGY from United States of America - Private actors also benefit from the exploitation of Palestinian natural resources. For example, Noble Energy, a US company that enjoys a monopoly over Israel's gas resources, along with Israeli companies Delek Drilling and Avner Oil exploited gas from the Noa well in 2012. This gas field runs into the Palestinian sea and is contiguous with Palestine’s border field. Any cojoint exploitation of the field required a cooperation agreement under customary international law. Palestinians were not consulted and the wells were unilaterally depleted in violation of customary international law. Any depletion of the border field from the Israeli side (likely due to the accelerated processing which was sanctioned in light of Israel’s gas shortages) also violates Article 55 of the Hague Regulations and amounts to pillage. GIVOT OLAM from Israel - Israeli oil company Givot Olam has exploited oil from the Meged-5 well. The oil has been unilaterally developed from the Israeli side but the well extends into Rantis in the West Bank. Israel has zoned the adjoining land on the Palestinian side as a military training zone, thereby preventing Palestinian access to their sovereign natural resources. The exploitation violates customary international law on conjoint development of contiguous resources, violates Article 55 of the Hague Regulations and amounts to pillage. Why? Explain briefly. Palestine's fishing industry has been devastated by Israel's lethal military naval closure of the Mediterranean Sea. Despite the obvious international human rights and international humanitarian law violations, securing criminal prosecutions and taking civil actions abroad against corporations has proved difficult. Al-Haq, 'Israel’s Deadly Catch: Israel Systematically Attacks Gaza’s Fishermen' (Report, 2015). This video presents the stories of three fisherman from the Gaza Strip who have difficulty earning a living because of the blockade and the army’s harsh restrictions on fishing off the coast.